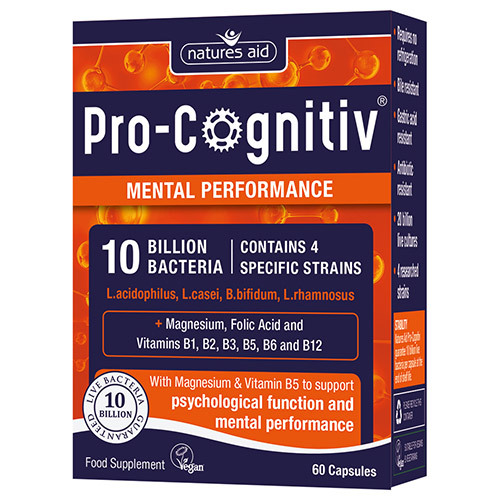 Natures Aid Pro-Cognitiv is a daily complex containing 4 extensively researched strains of bacteria; L. acidophilus, L. casei, B. bifidum and L. rhamnosus providing 10 billion live bacteria per capsule. 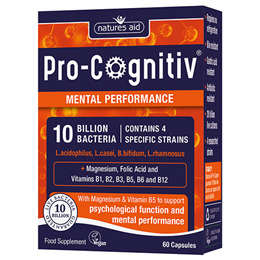 Pro-Cognitiv also contains magnesium, folic acid and vitamins B1, B2, B3 (niacin), B5 (pantothenic acid), B6 and B12. Magnesium, niacin, vitamins B6 & B12 all contribute to normal function of the nervous system, reduction in tiredness and fatigue, and normal psychological function. Pantothenic acid (B5) contributes to normal mental performance and to the normal synthesis of some neurotransmitters. Folic acid, vitamins B6 & B12 contribute to normal homocysteine metabolism. Pro-Cognitiv has been specially formulated by bio-chemists and nutritionists based on scientific research. Magnesium Oxide, Calcium Pantothenate, Vegetable capsule shell (Cellulose), Microcrystalline Cellulose, Pyridoxine Hydrochloride, Thiamine Hydrochloride, Riboflavin, Nicotinamide, Vitamin B12 preparation (Cyanocobalamin, Calcium Phosphate), Lactobacillus Acidophilus, Anticaking Agents (Vegetable Source Magnesium Stearate, Stearic Acid), Bifidobacterium Bifidum, Lactobacillus Casei, Lactobacillus Rhamnosus. Adults and children over 12 years: Take 1 capsule twice a day with food. Below are reviews of Natures Aid Pro-Cognitiv - Mental Performance - 60 Capsules by bodykind customers. If you have tried this product we'd love to hear what you think so please leave a review.